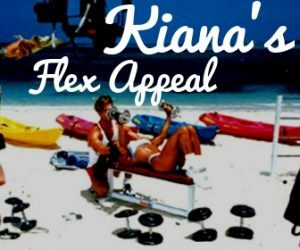 While filming Kiana’s Flex Appeal at Wide World of Sports and Epcot in Florida, I had the pleasure of having several Cirque Du Soleil cast members on my show. They were extremely athletic and were BMX Bike Athletes. Such fun to lead them through exercises to strengthen their core, legs and arms for their sport. They were my star cast members for the day! That evening, I attended the show with Jan, my make up artist and my mother Mom Tom. We went on a back stage tour (saw the talented cast in hair nets and thongs and all!) was interviewed for the Florida Press and also posed with my stars 🙂 We sat front and center to watch my new cast members for the day and the entire ensemble perform. Wow! What a show! A recent Fit Family Event was to watch Cirque Du Soleil and attend the VIP Party. What an amazing show for the kids and us big kids! I have seen almost all of the Cirque Du Soleil shows, a favorite is the one in Vegas. What I love most about the shows is that you literally get lost in the magic of the performance. The stunts are like nothing you’ve ever seen and so very daring, creative and artistic.